Lots of wedding couples are opting for destination weddings. Hawaii is one of the most popular places. It's beautiful and lets couples have a warm weather wedding any time of the year. If you're like me, you'll want to spend the money visiting Hawaii and not on wedding invitations. Don't get me wrong, you want to make a good impression. You can do that and save money. Just let the indie artists on Zazzle help out. All of the Hawaiian wedding invitations shown below can be easily and quickly customized. They are also really nice. No one will ever guess that you didn't go to some expensive wedding stationery store. The color blue is often associated with a Hawaiian wedding and this collection of Hawaiian wedding invitations begins with watercolor blue hibiscus flowers. The second wedding invitation shows how effective a blue border can be to showcase multi-colored hibiscus flowers. 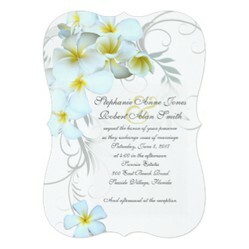 The last three invitations showcase tropical plumeria flowers. The first is an elegant design that has a crisp navy blue border. The second design features golden white plumeria on a square white background. The third shows a flourish of plumeria on an ornately shaped wedding invitation. Bright blue hibiscus flowers make a beautiful border along the bottom of this Hawaiian wedding invitation design. The watercolor blue hibiscus flowers have light yellow stems and green leaves. the lettering is done in coral. Very beachy! You don't have to get married in Hawaii to love these tropical flowers. All of the text is fully customizable. A vibrant aquamarine scalloped border frames the wedding details, while the hibiscus flowers are beautiful in the bottom left hand corner. You don't have to be married on the beach, if you have a Hawaiian wedding. Some wedding couples are just as happy to look at the ocean from a ballroom or chapel. The hibiscus flowers are deep purple, golden yellow and true pink. Green leaves pull it all together. Black text on a white background make the wedding details very easy to read! All of the text is fully customizable. Hawaiian weddings can be formal as well as informal. This elegant wedding invitation features white tropical flowers in the upper left corner. The navy blue background makes a stunning presentation. Wedding details are written in blue on the palest blue background. The edge is blurred for an artistic touch. The giant ampersand is a crisp white. All of the text is easily personalized in minutes. Traditional white plumeria flowers have just a touch of a golden glow. The white on white color scheme, makes it very traditional. However, the square shape and plumeria placement give it a modern touch. The wedding designer used a playful script to keep the mood relaxed. Perfect for a Hawaiian wedding or any other location. Easily customized template. A wedding invitation doesn't have to be square. Indie artist Sandpiper Wedding did a beautiful job matching the plumeria flowers to the shape of the wedding invitation. When you check out this wedding invitation, you also find all of the wedding stationery that matches. It is easy for you to customize all of the items, from save the date postcards to thank you notes. It's funny, I didn't know that DustyToes was the artist, until I took a closer look. She is indeed very talented. How very pretty these are! Kudos to dustytoes on an outstanding design. You're very welcome. These designs are some of the prettiest wedding invitations that I have seen on Zazzle. Thank you for including some of my tropical stationery. The Plumeria Flourish design is an especially good seller.